Collection every Tuesday for the months of April, May, June, Sept., Oct and Nov. The Borough has purchased a wood chipper for your convenience. PLEASE DO NOT MISTAKE THIS FOR A TREE REMOVAL SERVICE. We will chip a maximum of 10 large pieces of material or 5 bundles weighing no more than 50 Lbs. Contained materials not fit for the chipper will be collected as we do now. 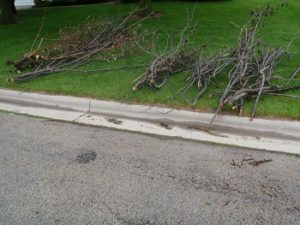 Please place limb lengths up to 15’ and 4” in diameter at the curb facing the same direction with the cut end at the curb. Hedge trimmings will be collected on the First & Third Tuesday during the months of July and August. Please place the trimmings at the curb on the evening prior to the collection in a rigid container such as a trash can and limit the weight to 50 pounds.